Spanish Skype is an online Spanish school which uses Skype videoconference to give classes. How does Spanish Skype work? a) First contact the teacher by completing the inscription form, including the course you would like to study, how many classes you would like to have and what day and time you would like to have the class. b) The teacher will then contact you by email to arrange a test session. 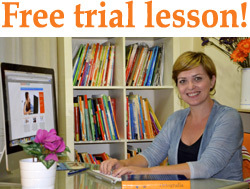 This test session allows you to meet the teacher, see how Spanish Skype works and decide if you like the class. The teacher will also assess your level and advise you on which course is most suitable. If you want to continue with the classes you arrange payment and the day and time you want to receive the class. c) A few days before your class the teacher will send you the material you are going to work on. What is an online Spanish Skype class like? The teacher will call you on Skye on the day and time previously arranged. Before the class the teacher will send you the material that you are going to work on in the class. With this material you will practise grammar, do a series of speaking, listening and reading activities and practise pronunciation. During the class the teacher will explain anything you don’t understand and will correct any mistakes. At the end of the class the teacher will tell you what exercises to do to help revise what you have studied in class. You can send this homework to the teacher and she will correct it before the next class. You can also contact the teacher if you have any problems doing the homework exercises. Do I need to use a webcam during the class? We advise you to turn on your webcam during the class to allow for better communication between the teacher and the student. The student usually feels more comfortable if they can see the teacher and body language is an important part of communications. However, the webcam is not obligatory and we will respect the student’s decision not to use it during the class. What language will the teacher speak in the class? During the class the teacher will speak mainly in Spanish. This is important as it allows you to learn Spanish in the same way you learnt your native language, by listening and repeating. However, if the teacher thinks it necessary to explain grammatical points she may talk in English. How often should I have a class? When will I notice my Spanish is improving? Before answering this question it is important to note that each student is responsible for their learning and that the teacher only gives them the material, method and opportunity to practise and learn. The learning process depends on the interest and motivation of the student, the number of classes they have a week and the exercises they do for homework. However, as a general rule you will notice an improvement after 10 to 20 classes. If you inform the teacher at least 24 hours in advance you can cancel a class without charge. For example, if the class is programmed for Wednesday 5th of April at 12,30 pm the student must inform the teacher before Tuesday the 4th of April at 12,30 pm. If the student cancels the class later than this time limit they will be charged for the class. You can cancel the class by any of the methods included in contact section. Can Spanish Skype cancel a class? If due to a force majeure (major cause) such as a natural disaster, problems with internet, power cuts or illness and the teacher is not able to give the class then it will be cancelled. The teacher will recuperate this class at a time to suit the student, and of course without any additional cost. What happens if the class is interrupted due to a technical problem (the computer, internet, earphones, microphone etc..)? Don’t worry. Spanish Skype will postpone the class for another day and time without any additional cost. You teacher will call you at the time arranged. If after 10 – 15 minutes it is impossible to contact you the class will be considered cancelled without previous arrangement and you will be charged for the class. What time zone should I take into account when arranging a class? Take into account that Spanish Skype is located in Madrid, Spain. You can look at the time zone map and calculate the time difference between Spain and your country. Paypal What is Paypal and how does it work?